CAPANNORI, Italy, May 17 2013 (IPS) - Capannori, a rural town in the Italian province of Lucca, in Tuscany, boasts a proud history. Six years ago, it became a trendsetter and leader, not just in Italy but throughout all of Europe, as the continent’s first Zero Waste town. Today, about 3.5 million Italian citizens carefully separate their waste into coloured bags before leaving them on their doorsteps for collection. The movement has spread further, too, to other European countries. Giorgio del Ghingaro, the mayor of Capannori (population 46,000), defines this trend as a “cultural revolution” that began with rubbish and in time went much further. Since 2007, residents of Capannori have reduced their urban waste by 30 percent as part of a Zero Waste strategy, which calls for the elimination of all superfluous waste – anything that can be recycled – by 2020. In Capannori, they are determined to meet this deadline. “Zero waste by 2020 is no utopia,” Del Ghingaro told IPS. “It is a concrete goal that we intend to achieve”. Initially, the project looked quite ambitious. Its model was that of San Francisco, California, which differs from the Tuscan town in size and conformation. Nevertheless, Capannori’s midterm goal of recycling 75 percent of waste by 2015 was met long in advance; the town currently recycles 82 percent. After Capannori tested door-to-door collection methods in one part of the town, successfully increasing waste recycling from 30 to 70 percent, “we decided to embark in the zero waste adventure”, Del Ghingaro said. Since then, Capannori’s waste management has become a model for all of Europe. Joan Marc Simon, executive director of Zero Waste Europe and European coordinator of the Global Alliance for Incinerator Alternatives, confirms that the Zero Waste strategy came to Spain through the Italian experience. "Italy, and Capannori in particular, was definitely the model to follow." “When it comes to waste, Italy has given the best and worst examples. But if you look at the good practices…Italy, and Capannori in particular, was definitely the model to follow,” Simon said. Since 2008, one hundred cities in Spain, all concentrated in Catalonia and the Basque Country, have adopted the strategy. “Southern Europe is giving a lesson on how things can and should be done in a more sustainable way,” Simon stressed. Rossano Ercolini, Capannori resident, primary school teacher and environmental activist who is the winner of the Goldman Prize for the environment, knows well how local experience can serve the rest of Europe. After all, he is the man who introduced the Zero Waste strategy to Italy – and Europe. It all started in 1997, when construction plans for an incinerator near the town encountered firm opposition. Ercolini, who is also president of Zero Waste Europe and of Ambiente e Futuro (Environment and Future), a local environmental movement, was part of it. Luigi, 67, has lived in Capannori for over 40 years. “People always find a reason to complain,” he said of the door-to-door collection system. “But honestly, I find the system quite easy.” Residents are given different rubbish bins and coloured bags, along with an informational flyer. “If you get it wrong, they just leave a note explaining why they could not collect your bag”. Indeed, the town decided to avoid fines, so as not to penalise residents for mistakes, and to reward residents instead. Beginning in January, they introduced something called an R-feed waste system. “Every family has been given a fixed number of gray bags… for non-recyclable waste, with a code on it. The garbage collector has a reader which stores the data so that every family will pay waste tax according to how much non-recyclable rubbish they produced throughout the year,” Del Ghingaro explained. Fifteen public water springs were restored and purified, and plastic bottles have been banned from all schools and public buildings, which now use only public water. For now, Ercolini’s task is to analyse the 18 percent of rubbish that still requires traditional waste management and find a solution. The results so far show that the main problem lies at the roots of the production chain. “Companies need to take responsibility for what they put on the market and redesign their products in order to make them sustainable,” he says. Following a letter of concern that the Capannori Municipality wrote to the coffee giant Lavazza, the company started a pilot project to substitute standard non-recyclable coffee capsules for espresso machines with new, reusable ones. 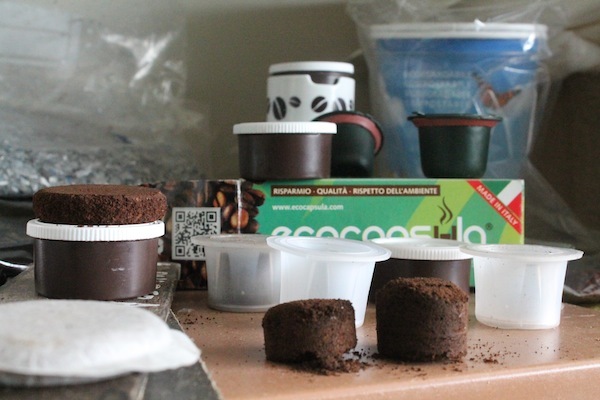 “We are also studying a way to use the coffee grounds to grow mushrooms,” Ercolini added. Zero Waste Europe’s Simon told IPS that he is optimistic and convinced that the Zero Waste strategy could become the standard for waste management. Indeed the EU, through the Roadmap to a Resource Efficient Strategy, has already established that by 2020 all European countries must stop using incinerators to burn anything that can be recycled. “Our movement is nothing but the vanguard of what…needs to become the norm,” Simon concluded. Another splendid example of what humanity needs to be doing if we, and most life on the planet with us, is to survive. Along with so many other splendid examples of good practice, this is being largely ignored. Our inertia will wind up killing us.